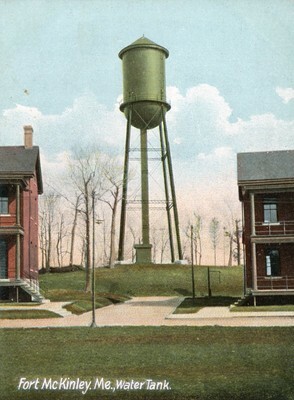 "Portland, Maine, Fort McKinley Water Tank "
An image scanned from a color postcard depicting a water tower at Fort McKinley on Great Diamond Island in Portland, Maine. Undated. Fort McKinley was constructed between 1891 and 1907 for the defense of Casco Bay. It was decommissioned in 1945 and remained abandoned until its redevelopment to commercial and residential use 30 years later.